NEW this year from our friends at Motawi Tileworks... 2 variations of the classic Dard Hunter Square Rose design. One of these new designs, "Clara", is presented here in our own handmade quarter sawn white oak "Legacy" style 3 inch wide frame molding - hand selected to ensure the best finish, with a slight bevel to the molding to draw attention to the tile. 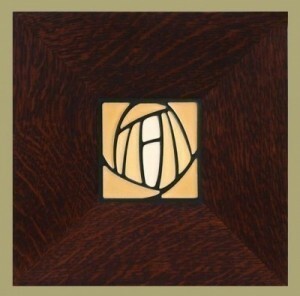 Pictured in our Signature finish; also available in a 2" wide, mitered "Oak Park" style molding, or available unframed. AND NOW FROM DARD HUNTER STUDIOS: Select one of 3 color choices for our hand applied finish at no additional charge! All three look fantastic with tiles by Motawi Tileworks.